This topic contains 5 replies, has 2 voices, and was last updated by Alexander Bautz 2 years, 5 months ago. You are loading the configuration from the code, but the variable spjs_listItemPreviewConfig is missing. That part of the code suggests that I start using the SharePoint 2007 setup, but using that for SP 2010 doesnt make any sense to me. How should I interpret this? Hope to hear from you! Pls let me know if I should post anything else. This topic was modified 2 years, 8 months ago by Thomas Lefebure. When the config is written in the description you are not supposed to use the variable. Remove the first two lines, and the last one and it should most likely work. Also the “Formula” should read configindescription=’1′ and not ‘2’. Tnx for the quick reply. I adjusted the code in the description and changed the configdescription from 2 to 1. However the error remains the same, does that make sense? It’s hard to tell without looking at it, but if you bring up the developer console (hit F12 > Console) – do you see any errors there? Also, have you tried putting the code in a CEWP in the page instead of in the description of the field to see if this performs better? Been a long time. Lots of other stuff to do. Now again some time to try and make this work. Hope you too can find some time to take a look at it. I’ve added screenshots. Again of the code inside the Preview-field. Changed it according your advice. Sadly Chrome gives no errors in the console and the original error about the missing spjs_ListItemPreviewConfig remains. 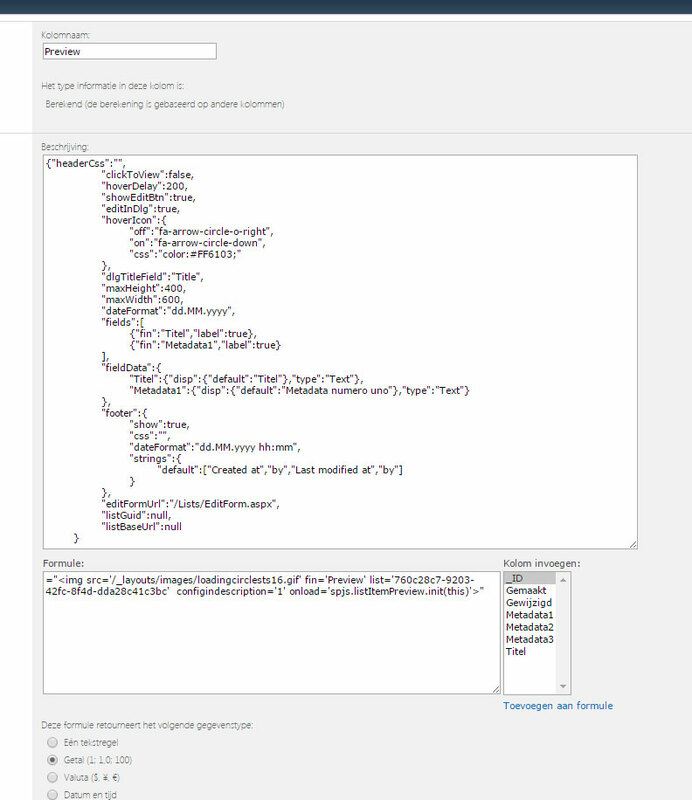 Please try the setup option where you don’t have the config in the field description textarea. You should find info in the original article.